KUALA LUMPUR: Kosmopolito Hotels International Ltd, a subsidiary of Far East Consortium International Ltd, plans to build another hotel in Kuala Lumpur next year. At present, works are being done to get itself ready to launch its first hotel in Cheras under the brand name Silka before the end of first quarter next year. The hotel is expected to be part of a new mall, which is located at where Phoenix Plaza used to be. "In the pipeline, are two projects in KL. Directly across the hotel, there's a Sri Jati Serviced Apartment. We plan to tear it down and rebuild and turn it into a budget hotel. We have received the local authority's approval. We should be starting our development and construction works sometime next year, ideally after Chinese New Year. 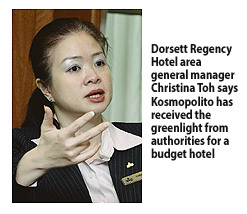 "We are still debating if it will be branded as Silka, or as a true-blue budget hotel," said Dorsett Regency Hotel area general manager Christina Toh. It currently has five hotels in Malaysia. They include Grand Dorsett Subang, Dorsett Regency KL, Grand Dorsett Labuan, Silka Hotel Johor Baru and Maytower Hotel & Serviced Residences KL. Toh was speaking to reporters after the company presented 12 of its managers with the Coaching and Mentoring Professionals (CCMP) Certification. The company worked with The Institute of Training and Development to come up with programmes to help improve the leadership abilities of its managers. "Not many out there are developing people. Today, people work for a company not purely based on how much they are paid, but also for career development and whether the company helps to improve their skills for career advancement," said Azizah Ismail, Kosmopolito Hotels area director of human capital. With the CCMP programme, she hopes the company is able to maintain or improve its staff retention rate. "Currently, our staff turnover rate is below the industry average which is about 10 per cent. For us, some of our hotels are doing about 1 per cent, but on average, we are doing about 5 per cent, which is significantly below the industry average," said Azizah. SP Setia will develop the Penang People's Park project on the grounds of the Penang International Sports Arena (Pisa). Pisa is an indoor sports arena close to the Penang International Airport. GEORGE TOWN: The Penang government has set a precedent for housing developers in the state by allowing SP Setia Bhd to build extra units within any of its developments on the island over the next 30 years. This comes under a build-operate-transfer (BOT) concession agreement that was signed on August 19 between the Municipal Island of Penang Island (MPPP) and Eco Meridian Sdn Bhd (EMSB), a wholly-owned subsidiary of SP Setia. A summary of the concession, which was prepared by MPPP's legal unit and disclosed yesterday, said MPPP agrees to grant EMSB the right to additional density of any SP Setia developments within Penang Island and this would be over and above the maximum permissible density for the land. This must not exceed 1,500 residential units spread out on the island during the concession period. The concession period is for 30 years and EMSB is also entitled to apply for a renewal for two further terms of 15 years each. Pisa was completed in 2000 and sits on more than 10 hectares, serving as the largest and most comprehensive multi-purpose indoor venue on Penang Island. The new project, estimated to cost up to RM300 million, is made up of three components - which include an international convention and exhibition centre, along with refurbishment works to the existing indoor stadium and aquatic centre respectively. The concession also compels EMSB to build 450 low medium-cost housing units. "The State Authority shall provide a piece of land for the purpose of the same," the summary of the agreement said. The deal also stated that MPPP has agreed to sell and transfer part of the 10 hectare plot to EMSB for the purpose of a hotel site with a leasehold title of 99 years. The purchase price of the hotel site is RM13.7 million. Sime Darby had on Aug 27 announced its intention to acquire 273 million Eastern & Oriental Bhd (E&O) shares and 60 million irredeemable convertible secured loan stocks (ICSLS) in E&O, which, on a fully diluted basis, amounts to a roughly 30% equity interest in this niche property developer. Sime offered RM2.30 for each E&O share, or a total of RM766mil ringgit for the block, with the sale shares coming from just three main groups: Datuk Terry Tham Ka Hon, E&O's managing director, Singapore-listed GK Goh Holding Ltd and a group led by Tan Sri Wan Azmi Wan Hamzah, formerly of Land and General Bhd. Will there be a mandatory general offer (MGO) for the rest of E&O's shares, since the combined block passing to Sime does not cross the necessary quantitative 33% threshold for it to take place, is a question which is being asked in corporate circles. According to the Mergers and Acquisition Code, in instances where a party buying stakes of between 20% and under 33%, there can be deemed to have been created a situation triggering an MGO. These instances are laid out in Practice Note 9 of the Malaysian Code on Take-overs and Mergers 2010 and largely involve situations where there is some arrangement between the vendor of the block of shares and the new buyer on how they are going to vote on company decisions, the ability of the acquirer to exercise control of the retained voting shares and the consideration. Our analysis is as follows. With 30%, normally companies would be able to have effective control when there is fragmented shareholdings. The vendors are selling only part of their shares and will have still 11.5% left among them. The biggest owner, Tham, who owns 15.7%, will still end up with a 5.1% stake post-acquisition dilution. A 60% premium is being paid, which is not something that can be scoffed at. Where does this leave the minority shareholders? Is it fair to them? We believe that in the circumstances, the Securities Commission should investigate whether the other conditions for an MGO have been fulfilled. And what of Sime's minority shareholders? Arguably, does Sime really need E&O all that much at that price? Much has been made of the mega-merger that integrated the property arms of the former Golden Hope Plantations Bhd, Kumpulan Guthrie Bhd and Sime Darby Bhd, which has given the group a massive and undeveloped landbank of 37,000 acres, as well as 126,000 acres in Sime Darby Vision Valley. With this massive amount of land on tap, Sime Darby Property's gross development value now stands at RM30bil. This purchase is one of the biggest developments since its leadership change, and as a leading government-linked company (GLC) which seeks to practice good corporate governance, an arguably more beneficial deal to all parties could have been proposed. The main sore point is the offer price which amounts to 19 times E&O's forecast earnings for 2012 and 1.85 times its price-to-book value, where by comparison, the property sector has an average of 12 times forecast earnings for 2012 and 0.8 times price to book value. Yes, the premium could be partially justified since it is a controlling block, but with a mere 30% stake, the extent of earnings contribution accruing to Sime is merely at the equity-accounting level as an associate, or a mere 0.6% increase to Sime Darby's profits in 2012 and 2013. So soon after reeling from its recent billion-ringgit losses in its energy division, it is hoped that the board had undertaken all due diligence in this deal. UOA Development Bhd, a Malaysian property developer, rose the most in a week in Kuala Lumpur trading after winning a RM101.4 million-contract to build a hotel in Kuala Lumpur. Its shares climbed 2 percent to RM1.53 at 9:03 a.m. local time, set for their biggest increase since Sept. 2.